Age 76, Gunnar Rebne enjoying the snow in Wisconsin Rapids where he had been skiing since 1931. 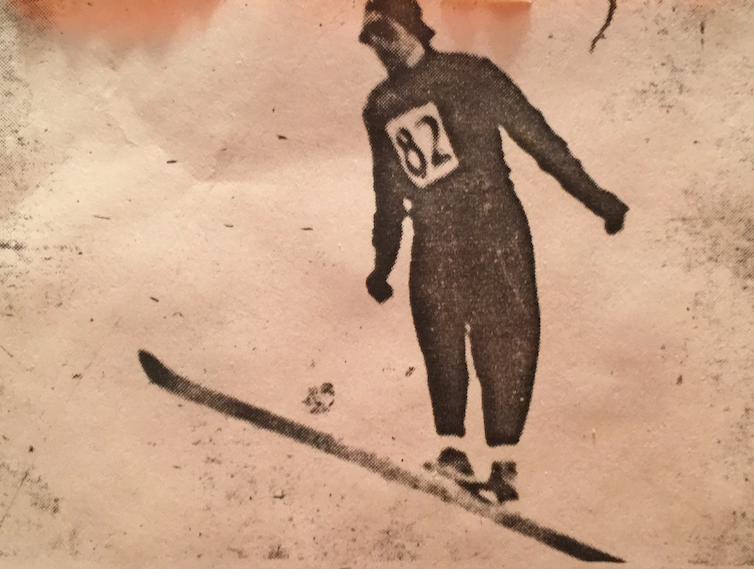 Gunnar Rebne immigrated to the United States from Stor-Elvdal, Norway, a small town of nearly 1,000 where most parents started to teach their children to ski at the age of five. Rebne was a young man who wanted to see what the American Dream was all about, so at the age of 20 he decided to take a boat to settle in Park Falls, Wisconsin, where there was a big Norwegian community. He came with his best friend, who shared the same dream as him, to become one of the best skiers in the world. Like many, my great-grandfather came to America looking for opportunities he did not have in his home country. With his passion for skiing, he set out to achieve his dreams. Back in Norway, my great-grandfather lived a very simple life with very little. He lived with his parents and siblings, where the only thing children did in their free time was ski. Following in footsteps of his brothers, Rebne found his passion for skiing at the age of five and a pastime soon became a lifestyle once he got to the U.S.
Leaving his family behind and coming with only a suitcase full of belongings, he took a boat out of Norway, sailing to the United States. Before immigrating, the requirements to come to the U.S. in 1928 were very strict. My great-grandfather had to show proof of a job in America, a place of residence, and had to speak English before getting on the boat. With only proof of a job and residence, he somehow managed to sneak by with knowing very little English. After arriving in Wisconsin, my great-grandfather worked at the Port Edwards Paper Mills. This was just a way to get money as his real dream was to become a professional skier. As he started to ski more and dedicate his time to his dreams, his career finally blew up. He began to start travelling the world for skiing where he finally made it to the big stage and was able to quit his job to focus on his goals. In 1936, he took the fourth place finish in the National championships where after he was interviewed by reporters and said, “While I have taken a number of firsts and seconds and others, the highlight of my skiing is this moment, taking the 4th place finish in the National Championships.” Not only did this moment put his name on the map, but it also qualified him for the 1936 U.S.Olympic Ski Team. The newfound love he had for America shined through, as he wanted to ski for the U.S. ski team, instead of skiing for his ‘home’ country. Taken by a reporter in St. Paul, Minnesota in 1935, Gunnar Rebne became famous for skiing with just one ski as a hobby. Just as his American Dream looked like it was coming true, he was faced with a difficult setback: he did not yet have citizenship papers. He told a reporter, “I needed to get the papers for another 5 years, and the lawyer who said he’d get them for me wanted $50. Times were not easy, and I didn’t have $50 so I didn’t get the papers in time.” Without the money, he was unable to follow his team to Berlin, Germany, and had to give up his spot on the Olympic team. Although devastated, he did not let this disappointment bring him down, he continued to ski until 1945 when he retired. Even though he was unable to compete and show the world his talents, he still made a living out of skiing and showed his family back home the talent he was made of. After retiring, he had been in the U.S. for nearly twenty years and he finally learned how to speak good English. As he was someone who got bored easily, he was tired of sitting at home, and he decided he wanted to give back to the community that enabled him to make his dreams come true. He switched careers from being a professional athlete and went into politics, becoming Park Falls’ mayor. 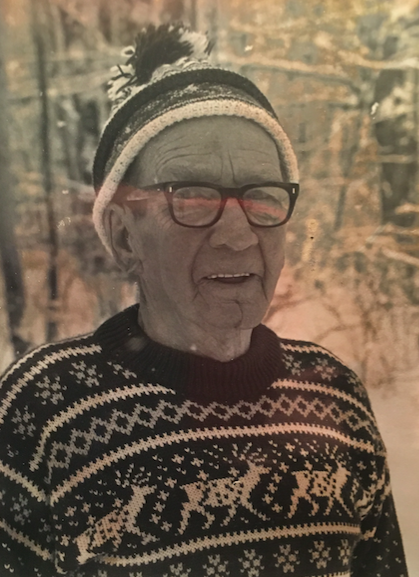 Since 1945, he has jumped about once every twenty years, devoting his ski time to cross-country on his own 5 mile trail from his house along the Flambeau river in Wisconsin. Less than two months before his 76th birthday, he opened at Dyracuse Mound for the 50th annual meet, with a 20 meter jump. He proved to everyone watching, something his family and friends already knew, that his age was no match for the youth in his heart. After making such a big journey from Norway to America and having to adapt to a completely different culture than what he was used to, my great-grandfather, Gunnar Rebne, showed that the American Dream is alive and thriving. 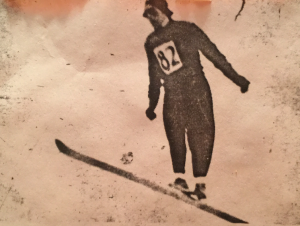 A long career of ski jumping in the 30’s allowed my great-grandfather to perform on almost all the major hills in the country. He turned his athletic abilities into a career, he reached his childhood dream of becoming one of the greatest skiers in the world. Starting from nothing, he showed the world that through hard work and dedication the American Dream is possible. He came to America with one dream in mind and although some could say he did not fully reach it, my grandpa died at the age of 77, proud of the achievements he made in the United States. His legacy still lives on, as my parents named one of my brothers Gunnar, who just so happens to be a very good skier as well, coincidence? I think not. The story of Gunnar Rebne was written by his great-granddaughter, Teagan Felt.